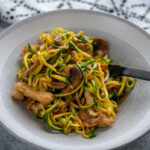 A delicious sweet and spicy pork tossed with fresh zucchini noodles for a healthy yet tasty treat. Caramelized Pork Lo Mein is a quick and simple dinner to satisfy your take-out craving. Is there anyone here that doesn’t enjoy a good take-out Lo Mein? There’s just something about those noodles that satisfy a craving for a certain kind of comfort food. But the fact is you often end up feeling overstuffed. Not to mention it can get expensive quickly. But making your own version of take-out food at home? Brilliant! 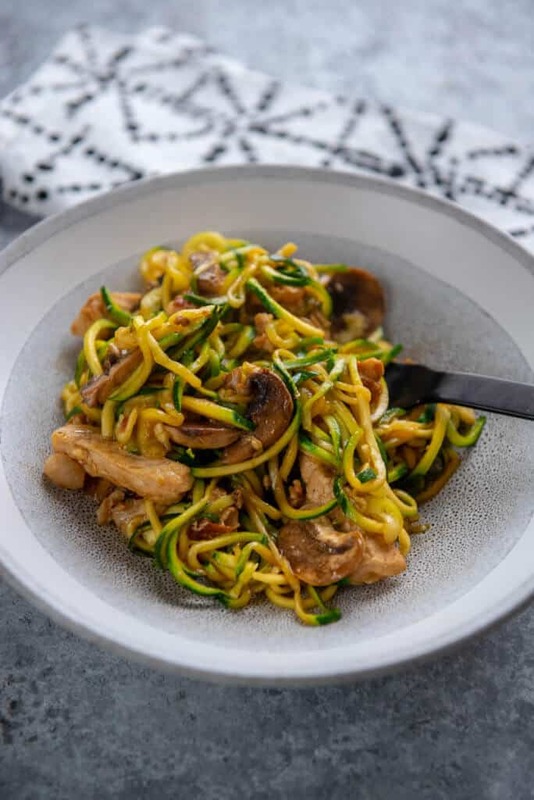 Swap out the usual noodles for some zucchini noodles and not only do you get a lightened up dish, but it’s packed with extra nutrition and won’t leave you feeling like you need a good long nap. 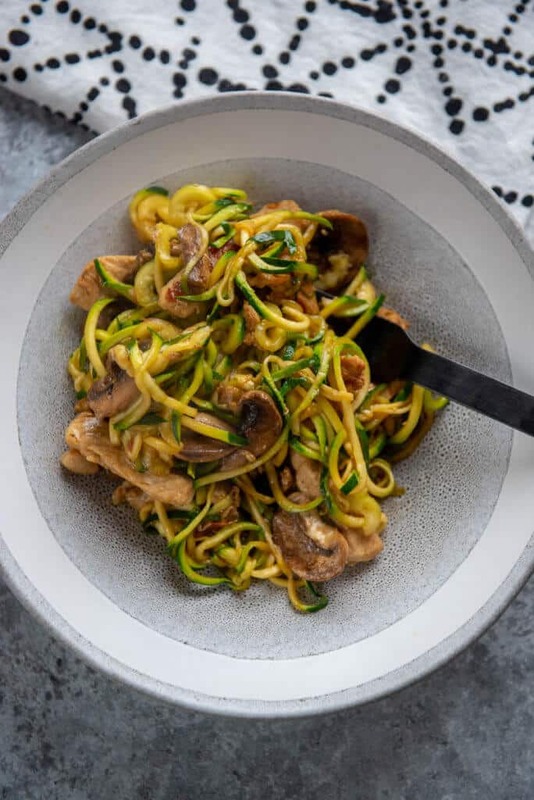 We could really go either way in naming this dish, since we do technically toss these zucchini “noodles” in the pan to cook a bit so in a way they also get fried. But we are going with loin since we don’t want to overcook as they are a little better if the zucchini keeps a little bite to it. You can now buy zucchini noodles ready to use either in the freezer or refrigerated produce section. My experience with both is that they are fine, but making them yourself is super quick and the results are quite a bit better. I love having a spiralizer to make all kinds of noodles myself at home. I’ve tried out a few different brands, and this is by far my favorite one. I prefer blade D for this recipe, but any will work. 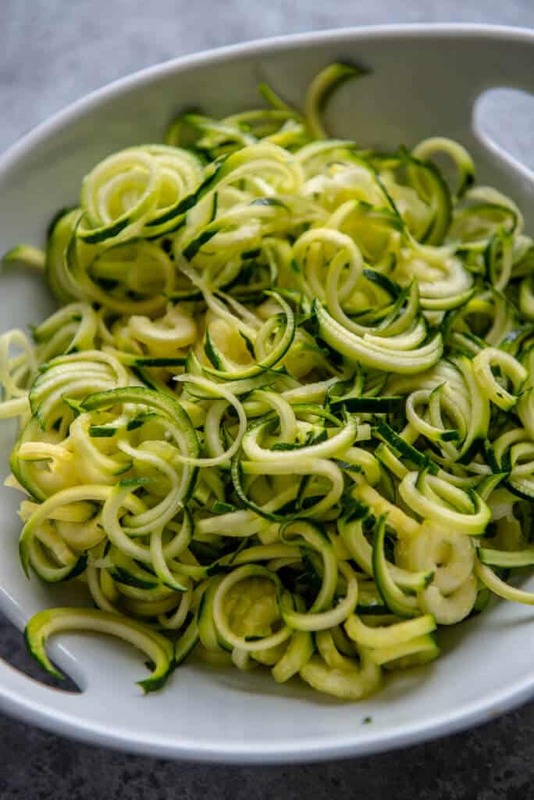 Check out Ali’s post with all the details on how to spiralize zucchini. 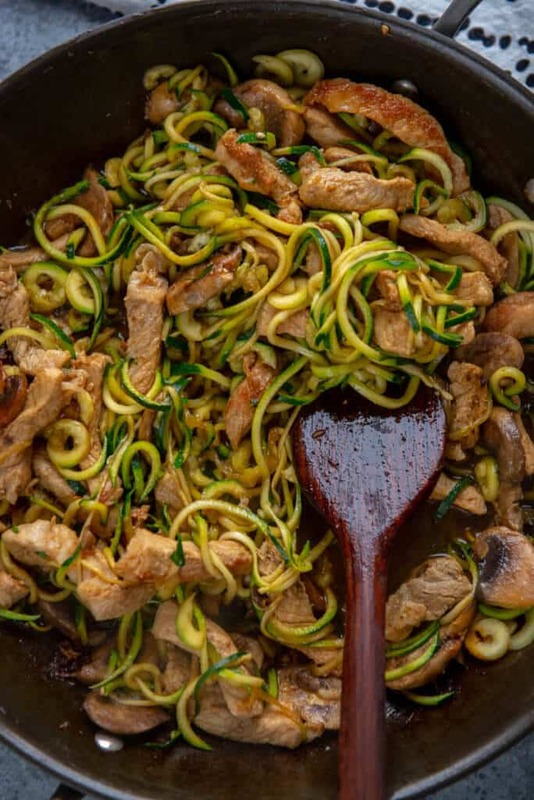 A delicious sweet and spicy pork tossed with fresh zucchini noodles for a healthy yet tasty treat. 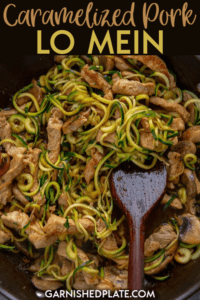 Caramelized Pork Lo Mein is a quick and simple dinner to satisfy that take-out craving.